Two sets of appointed officials are lined up to okay a project that explicitly violates the law. The Metropolitan Council is promoting sewer replacement construction that contravenes the Coldwater protection law by threatening the flow to this 10,000 year old spring. UPDATE: * The Minnehaha Creek Watershed District meeting to discuss & vote on the sewer project permit was postponed to Thursday, March 26 to allow more time for the public to comment. 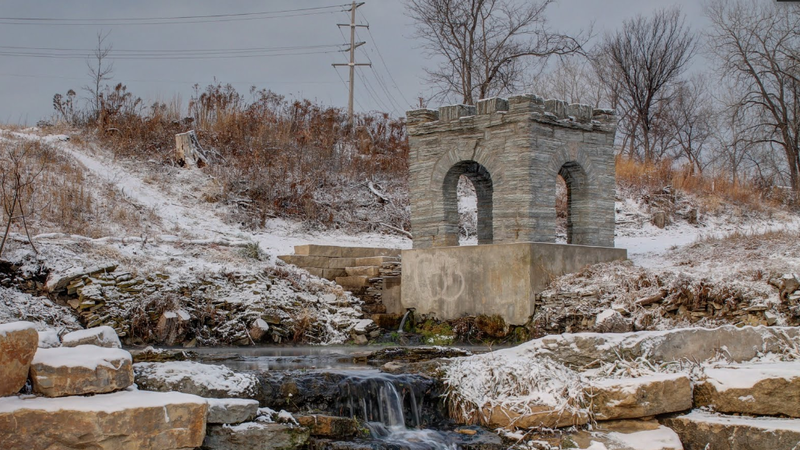 The Minnehaha Creek Watershed District is set to permit the project with assurances about “contingency plans” for unforeseen circumstances, “restoring” Coldwater Springs after “temporary” dewatering, and orders to monitor the spring daily during the 2-year construction project. The language of the law is specific, forbidding “any action that may diminish the flow.” Not “temporary” dewatering, not permanent dewatering—no “action that may diminish.” The language of the contingency planning (below) is slippery. Coldwater is the last major natural spring in Hennepin County, is where the soldiers who built Fort Snelling lived (1820-23) and where a civilian pioneer community gathered to service the fort. Some consider Coldwater to be the birthplace of Minnesota. 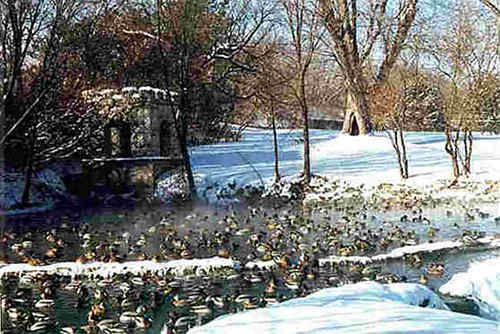 The spring furnished water to Fort Snelling 1820-1920. THE PROJECT: Metropolitan Council Environmental Services (MCES) project 1-MN-344 Tunnel Improvement: A sanitary sewer pipe is scheduled to be replaced at the north end of Minnehaha Park. It is an underground construction, about 45 to 50 feet below the surface, with two 18-foot diameter access shafts cut through bedrock at either end, and a 44 by 60-foot subsurface vault. Groundwater “will just flow around” these subterranean buried structures after construction planners reported at Minnehaha Creek Watershed District board meeting (1/29/15). A replacement 1,000-foot pipe would run horizontally below Minnehaha Creek, the Hiawatha Light Rail Transit line and Highway 55 to replace a 1930s-era sanitary sewer pipe. The project is scheduled to run for two years from this summer to June of 2017. Both groundwater and deep well dewatering is planned that is, pumping water out from above the limestone bedrock and below in the sandstone. Daily monitoring at Coldwater is called for. Assurances by experts of “no loss of flow” from the Highway 55 reroute resulted in the permanent loss of nearly a quarter of the flow to Coldwater. MnDOT was court-ordered to monitor the spring flow for 20 months post-construction. Despite the Coldwater protection law a permanent, daily loss of flow of 27,500 gallons was reported. Coldwater Spring is being replanted tomorrow (see Paganistan Weekly below), and how can restoration not be a great thing? How this sacred place has gotten to its current condition, a bulldozed and denuded site, ready for the National Park Service (NPS), to “restore” is a very long story. Susu Jeffrey tells it better than most anyone, and her recent article in the “Southside Pride” community newspaper gives you an update (reprinted in full at bottom). There remains an ongoing struggle to have this site declared, as the Minnesota Historical Society supports, a Dakota traditional sacred site, a “Traditional Cultural Property (TCP)”. The National Park Service told the Mendota Mdewakanton Dakota Community that they could not hold a pipe ceremony on opening day at Coldwater Park, Saturday, September 1, 2012. The community held a pipe ceremony anyway while the National Park Service brought in an armed man in a bullet proof vest. People considered this disrespectful at a sacred site. The park service refuses to honor the Traditional Cultural Property/sacred designation at Coldwater.The National Park Service clearcut most of Coldwater and now wants volunteers to plant toothpick trees where NPS wants new trees. NPS has solicited donations for new trees: $1,000 for a dozen; $100 for one tree. It’s an extremely dry year for new trees. Survival is iffy. Gather at the entrance to Coldwater Springs, 7 PM – This is a crafty, child friendly gathering. Native elders have asked people to leave offerings “for the ancestors” at Coldwater. We will make natural offerings from the beautiful “weeds” around the front gates. The federally recognized Lower Sioux Indian Community Council declared Coldwater a Traditional Cultural Property and “sacred” in 2006. Unfortunately the National Park Service refuses to acknowledge Coldwater Springs as a sacred site for Native Americans and others. Traditional group howl! 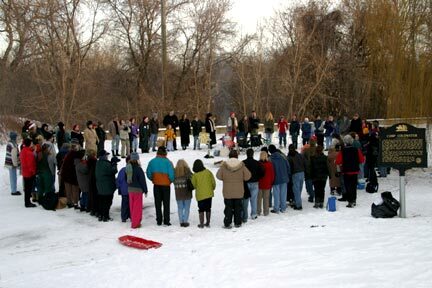 Full Moon celebrations at Coldwater have been observed every month since 2000. DIRECTIONS: Coldwater Springs is between Minnehaha Park & Fort Snelling, in Minneapolis, just North of the Hwy 55/62 interchange. From Hwy 55/Hiawatha, turn East (toward the Mississippi) at 54th Street, take an immediate right, & drive South on the frontage road for ½-mile past the parking meters, through the cul-de-sac and into Coldwater to park free. Starhawk, Pagan author, Reclaiming Tradition co-founder, and social justice activist will be visiting the Twin Cities in support of the Occupy Minnesota movement next Monday and Tuesday, December 5-6th. Starhawk will be appearing Monday, December 5th at Mayday Books, 301 Cedar Ave S, on the West Bank, Minneapolis from 5-7pm offering a meeting facilitation training session. The Occupy General Assembly begins after at 7pm at the Occupy Minneapolis site, 300 S. 6th St, Mpls, MN. This is a fairly spontaneous trip and further details of Tuesday’s schedule and further training opportunities will be updated. I interviewed Starhawk by phone this morning about Pagans and the Occupy movement. What do you see as your role for the Occupy movement in Minnesota? My role with the Occupy groups has been trying to plug-in around training and meeting facilitation. That is where I have the greatest contribution to make, and I have seen the biggest need. Everyone suddenly decided to go out for large consensus in the park, but most people don’t have any training or experience with meeting facilitation. General Assemblies are not the easiest place to start in facilitating a meeting! I have many years of experience with consensus and with different forms of meetings and group process and with democratic and horizontally structured group organizing. I think this type of group is very familiar to us in the Pagan community. What particular experiences and perspectives might Pagans bring to the Occupy Movement? What Pagans bring is first, most of us have experience working collaboratively in circles or small groups. That is a form of organizing. We have a basic approach to life, spirituality, to the world, that doesn’t depend on an external authority, No, we are our own authority. Secondly most Pagans learn about energy and awareness, and that is really key in preparing for action and holding and maintaining non-violence in the face of violence. Facilitating a meeting is a lot of watching the energy and moving with the energy. Thirdly, I think we bring an ethic that we are supposed to take care of the Earth, and take care of our people. We are all interconnected. We have to live our lives and shape our society based on those values. That is why the Occupy movement is really exciting. The inmates at various Department of Correction Facilities have been tracking this discussion of Pagans in Prison, and are aware of the civil rights issue in Stillwater Prison. Nearly all Pagans in prison find that path in prison. They have no history with a ‘Pagan community’. They have the idea that we as Pagans have a spiritual community like many Christian groups do. Inmates, therefore, tend to have a real idealized vision of our ‘Pagan community’. We are presumed to have facilities, programs, ministers, outreach programs, and the dedication to help our ‘brethren’ in need, and they know they certainly need help. Maybe they suffer from the same attitude we hold, we want a lot from our community and don’t have the time or resources to put a lot into it. Many of the facilities have functions, and Faribault is considered an ‘exit’ facility. It houses over 2200 mainly low risk inmates, double bunked, with mainly shorter terms. They are preparing to leave incarceration in a few months to a few years, and will be approaching our community as they seek their Pagan paths. What do you want from the Pagan community as Pagans in Prison?